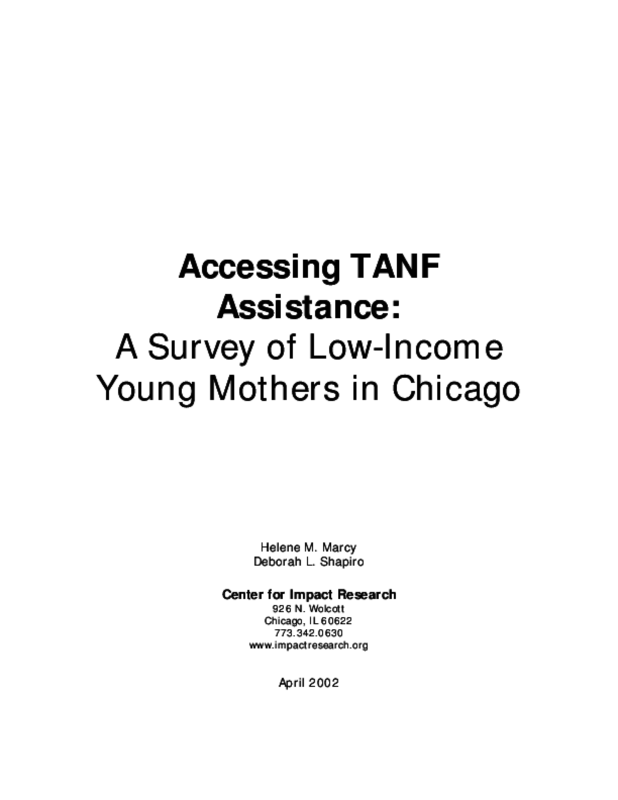 In 2000-2001, the Center for Impact Research (CIR), in collaboration with other concerned organizations, set out to obtain more information from young mothers about their experiences with TANF (Temporary Assistance for Needy Families) receipt in order to determine if changes in the TANF application process for teens are needed, and whether the Illinois Department of Human Services (IDHS) is effectively engaging teens in the TANF system. Working with community-based organizations, CIR trained young mothers to locate and survey other young mothers in low-income communities. A total of 601 young mothers, ages 13-21, were interviewed. Summary of Findings: CIR found that many young mothers were told they were ineligible for TANF and left TANF offices without having filled out applications; that those who had applied and were not receiving TANF were in need of education and employment; and that the older respondents -- who no longer qualified for the in-depth case management -- were experiencing more hardship than younger respondents.